I looked, and behold, a black horse; and he who sat on it had a pair of scales in his hand. “The Black Horse” is a continuation of the analog and modular based compositions explored on Bluetech’s early 2016 release “The White Horse” and “The Red Horse”. Ranging from dark detroit influenced electro and synthfunk to IDM and melodic techno explorations, this release pushes forward in an analog based approach to sound design. “The Black Horse” is the third release in a series of 4 EPs referencing the Biblical bringers of the Apocalypse. 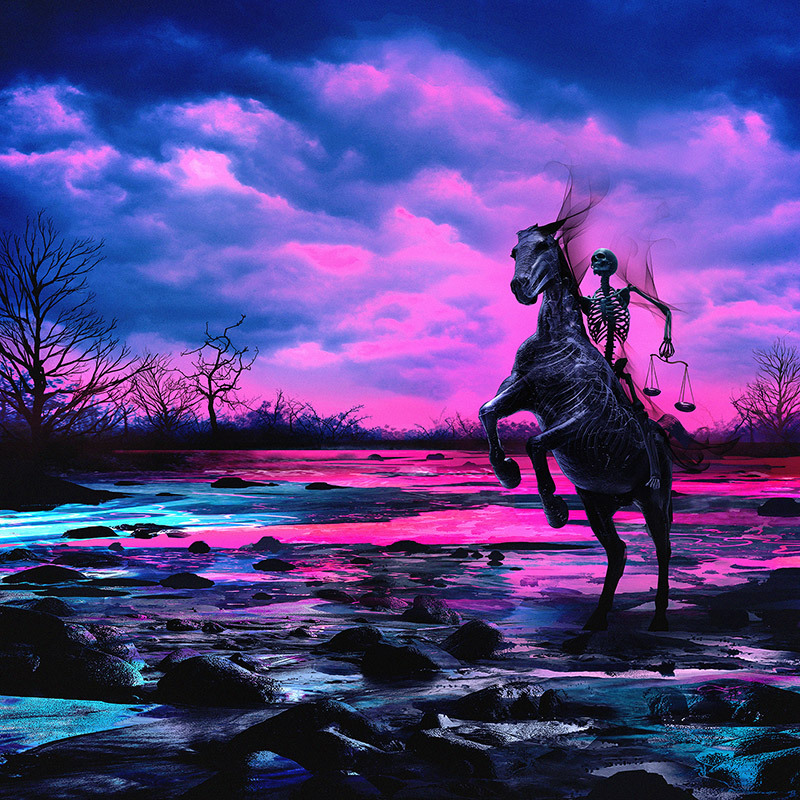 Drawing inspiration from the classic fantasy art of Moebius, Beksinki and Syd Mead, “The Black Horse” dances around eschatological tropes with tongue firmly placed in cheek. Featuring gorgeous artwork from concept designer Justin Totemical, each release in the series will present a facet of the visionary prophetic current culminating in a double vinyl LP release featuring all four artwork panels in proper large format glory. “Emerging from a long period of creative drought and personal struggle, I was seeking a way to frame my own experience in a larger meta-narrative. Navigating through loss and painful transformation always feels apocalyptic, so I wanted to take the opportunity to not only frame my heartbreak in a larger context but also to really laugh at myself and experience the high drama of being human with a sense of humor. The Revelations of our little lives feel like the end of everything, and looking out of our windows of meat and bone we feel the ground rumble with the approach of the 4 Horsemen. On a larger scale, it’s easy to draw parallels between the realities of modern life and the harbingers of ‘the end’ in John’s symbolic vision of the end of the Roman Empire. We are in the grasp of a dying empire watching the destruction of our biosphere, and yet… every seed must go to ground before new life emerges.